Ragi Dosa is a crispy, nutritious tiffin recipe. Ragi is also called as finger millet or Kelvaragu. It is loaded with calcium, dietary fiber, potassium, amino acids and helps to lower blood glucose & cholesterol levels. Also they help to reduce weight and are easy to digest. 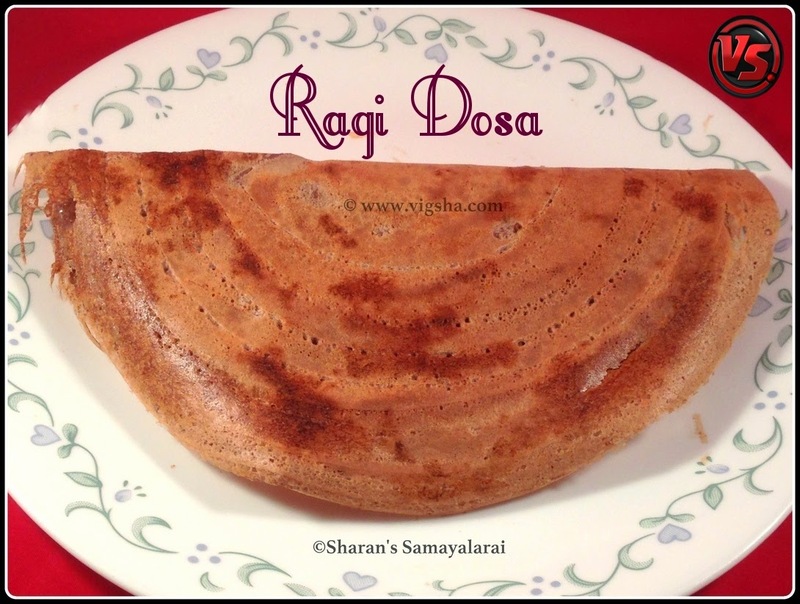 Don't miss to check the notes for instant ragi dosa and other versions of making Ragi Dosa. 1). Combine all the ingredients(excluding oil) in a large mixing bowl. Add enough buttermilk or water to form a runny batter of thin pouring consistency. Stir well to combine. 2). Heat the pan, pour a ladle full of dosa batter and quickly spread evenly in a circular motion. Drizzle 1 tsp of oil along the edge of the dosa and the gaps in the middle. Let the dosa cook for around 2 to 3 minutes till its crisp and browned. When crispy, fold over and serve hot. I served this nutritious recipe with Peerkangai Chutney & Peerkangai Thol Chutney. # Version1 (using Ragi) :- Soak & grind a cup of idli rice, 1 cup urad dal, 1 tsp of fenugreek and 1 cup ragi to a smooth paste. Keep it for 8 hours for fermenting and prepare Idli or Dosa with this batter. # Version 2 (Using Ragi flour) :- Soak & grind a cup of idli rice, ½cup urad dal and 1 tsp of fenugreek to a smooth paste. Then combine Ragi flour and salt, keep it for 8 hours for fermenting. # Version 3 (Without Rice) :- Soak 1cup of Urad dal and 1 tsp of fenugreek, grind it smoothly. Soak Ragi flour in water for half an hour and mix it with urad dal batter along with salt. Leave it for 6-8 hours for fermenting. # The measurements in the above versions can be altered to suit your taste. # You can also add chopped onions, curry leaves and green chillies to the batter and make it wholesome. # For instant ragi dosa, mix ragi flour, salt and butter milk. Then add chopped onions, green chillies and curry leaves, combine everything to a runny batter.